FAMIUM IoT provides a common interface for Internet of Things devices to make them available on the Web. Access today’s heterogeneous devices such as TVs, smart home devices, wearable devices effortlessly. Connected devices are exposed through a set of extensive APIs that application developers can leverage in Web applications. FAMIUM IoT allows straightforward access to sensor data streams and controls actuators. Your connected devices become smart! Easily expose devices via FAMIUM IoT to make them available to Web applications. FAMIUM IoT gathers data from sensors and actuators. Data is available through MQTT and RESTful APIs. Manage your devices and data using FAMIUM IoT Web communication protocol. Supporting popular devices like Arduino embedded controllers, Raspberry Pi and other embedded devices, application developers benefit from Web APIs to access sensor data and actuators like iBeacons. 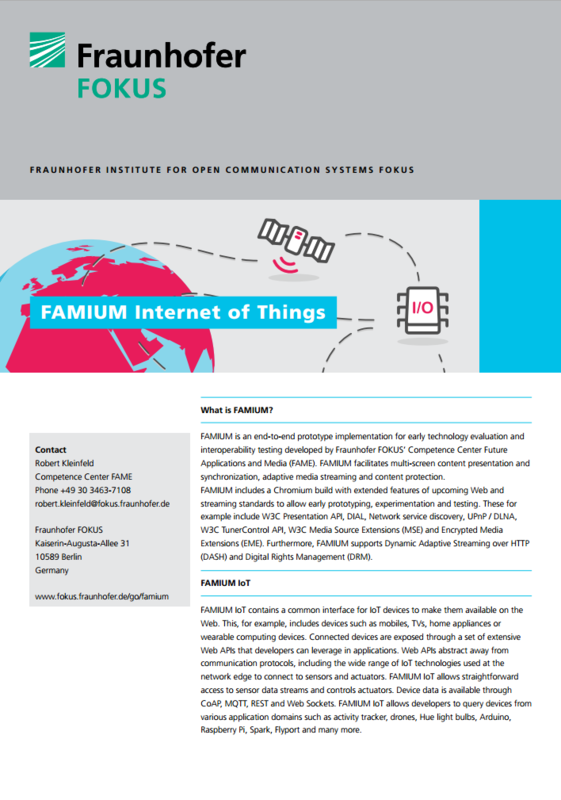 To stay updated on the latest developments of FAMIUM Internet of Things and news of Fraunhofer FOKUS FAME, please subscribe to our newsletter.